﻿ New Cher Single "Prayers for this World"
Cher’s new single, ‘Prayers For This World’ will be out January written by Diane Warren. 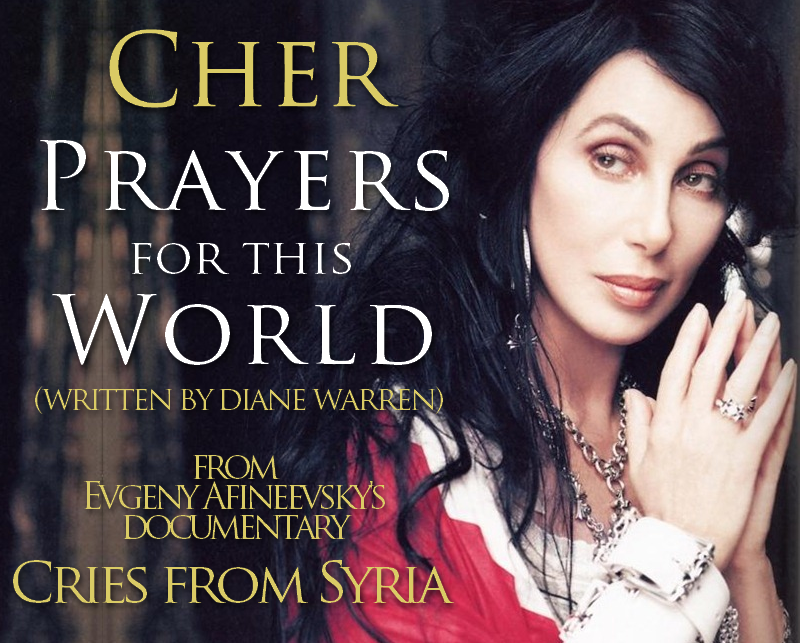 It will be Cher’s first new material since 2013’s ‘Closer to the Truth’ and will feature on Cries from Syria documentary by Evgeny Afineevsky. The movie focuses on child protesters, revolution icons, activists and their relatives, and high-ranking Army generals who defected to join the fight of the people. It tells the story of the Syrian people who have never lost hope. This film will take the audience on a unique journey in time, from Syria to Turkey, through Jordan, Lebanon and Europe. Looking forward to it! Hope it has an impact! wish her all the best! Every time she teams up with Diane Warren things go well! YaY!!!! Finally something new from our queen! World needs more than one single to be helped. And you could do it. Cher has announced that she is going to star in a film called Flint – a movie inspired by the water contamination crisis. Sounds pretty good. Can’t wait for Flint! I am coming to see you in MD, September 7th. My birthdays! Luv you queen Cher! Our queen is rising again! Its not out yet ! Anytime soon ? Can’the wait for the new song and album. Will see her in Vegas later this month on my birthday. Sure wish I could meet her. Have loved her since the Gypsys, Tramps & Thieves days. Not getting any younger! I can’t wait to hear your new song! I thought it was coming out in January?? Like everytime she’ll take 3 or 4 years to réalise it and it ll be completely upset …. Closer to the truth ….. It was completely upset …. The movie about Flint will be on Lifetime. The lowest you can go. What a step down from being an academy award winning actress. The Flint movie, the stage bio of her life, the new song to help refugees….it ALL SOUNDS GREAT !!!!! GO CHER Wa -HOOOOOO!!! !